Finding a hotel that matches your values can be a challenge! Believe it or not it's possible! 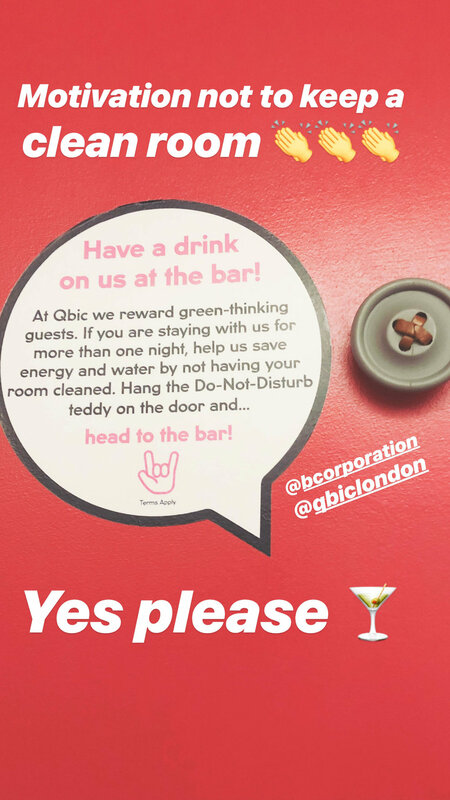 During our stay in London we stayed at the Qbic Hotel, a certified B Corp. I'm so impressed with their initiatives and dedication to sustainability. Qbic was actually the first B Corp certified hotel which is AWESOME! If you're unfamiliar with B Corp, they are a third party that certifies businesses based on their eco-friendly, social impact, and transparent initiatives. The certification process can take a while and that's why it's so awesome to support B Corp certified businesses. Qbic is located in the Whitechapel neighborhood, while a bit outside the main part of London, a two minute walk to public transit. There were plenty of restaurants and cafes within walking distance. Qbic even provides bikes for guests, if they're looking for an efficient way to get around town. Qbic generates part of their own electricity through solar panels. Their green initiative also includes electric car charging stations and energy efficient lights. The "greener" guests are rewarded with free drink coupons if they choose not to have their room cleaned. Although we didn't end up receiving free drink coupons, I love this initiative. AND all cleaning products are chemical free! Our room was very comfortable. I appreciate the quirky, creative design through out the hotel. We chose to stay in a room that did not have any windows because it was the cheapest option. While I was slightly concerned about this at first, it turned out to be great! 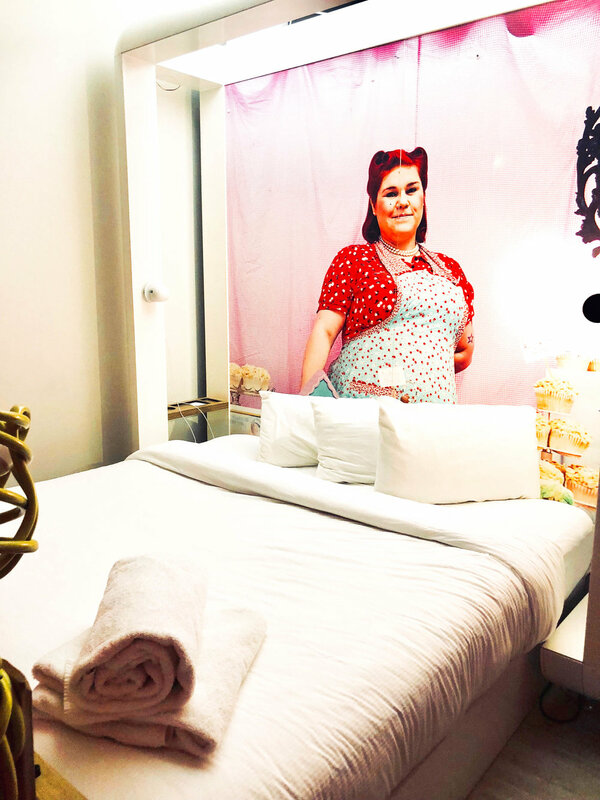 The room was incredibly comfortable, allowing us to control the temperature of our room. The room was well lit too. Our bed was incredibly comfy! Handmade with organic and natural materials, is a guarantee for a perfect night sleep. I also appreciate the organic toiletries called Stop-The-Water-While-Using-Me. Not only was this an excellent reminder to save water, but they smelled great as well. I used the shampoo, hand soap, & body wash. All great for my skin as well. We really enjoyed the hotel restaurant! They had excellent cocktails and food. All their food is sourced within a 50 mile radius! And you can tell! Very fresh! The staff was very attentive as well. I hope to make it back to London and stay the Qbic again!